Hide deals from seller "Victory Leathers"
Hide deals from category "Leather Goods"
Limit 1 per person and 1 per transaction. Valid on 2 pairs of motorcycle sunglasses. Promotional value expires 30 days after purchase. 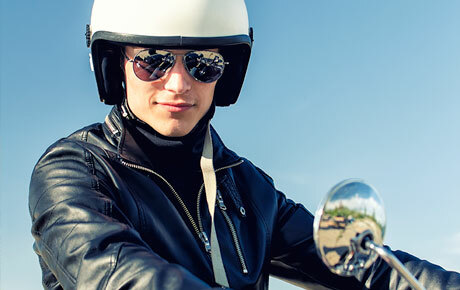 Spend your summer riding in style with this Independence Day deal for 50% off two pairs of motorcycle sunglasses from Victory Leathers in Palatine ($14 value). This biker’s paradise offers a wide array of products and gear to make the most of your riding experience. Victory Leathers stocks only high-quality merchandise, making their storefront a worthwhile visit for everyone from diehard leather lovers to curious passersby. Their wide selection of sunglasses gives every rider a comfortable and stylish option that will keep them safe from the bright summer sun. In addition to sunglasses, Victory Leathers carries everything from boots, gloves and bags to jackets and a variety of trendy Ed Hardy merchandise. Soak up the summer sun with this deal. A Palatine store that offers an assortment of leather apparel and accessories.